In the one-time city of grunge, Oasis kicked off their world tour before an ecstatic audience at the WaMu Theatre in Seattle last night (August 26). The band opened with Rock N Roll Star and followed with songs such as Lyla, Slide Away, Supersonic and Wonderwall. Four new songs off their upcoming album, Dig Out Your Soul, figured into the set: The Shock Of The Lightning (see the video here), Ain't Got Nothin', To Be Where There's Life and Falling Down. 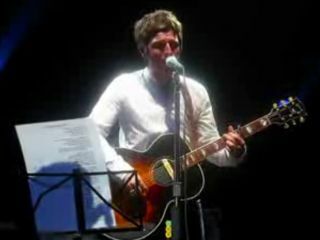 Noel Gallagher also performed a beautiful acoustic version of Don't Look Back In Anger, which you can see here. Before closing the show with their traditional cover of The Beatles' I Am The Walrus, Noel introduced the crowd to the band's new drummer, Chris Sharrock, who was making his first full appearance with the group. Gallagher jokingly warned the audience not to get used to the new man behind the kit as, in his words, Oasis were "trying to break Spinal Tap's record" for the number of drummers. Oasis' next eight shows will take them through Canada before the band plays a one-off UK show at the Eden Project in Cornwall. Tickets for the gig are only available via the official Oasis website. Fans must register on the site, with tickets been allocated via a draw. Registration opens at noon Friday (August 29) and remains open for a week (September 5). Successful applicants will be notified on September 8 and will have a period of four days to purchase up to two tickets for the show. And remember...if you can't get tickets, don't look back in anger.